Offering a modern translation of “The Legends of the Eighty-four Mahasiddhas,” a 12th-century Tibetan text, translator Keith Dowman shares stories of the spiritual adventurers, rebellious saints, and enlightened tantric masters of ancient India known as “siddhas.” He shows how the mahasiddhas arose from the grassroots of society and represented an entire spectrum of human experience. Counted among the greatest of the siddhas are a washerman, a cowboy, a thief, a conman, a gambler, and a whore, all extraordinary men and women who attained the goal of their meditations, as well as enlightenment and magical powers, by disregarding convention and penetrating to the core of life. 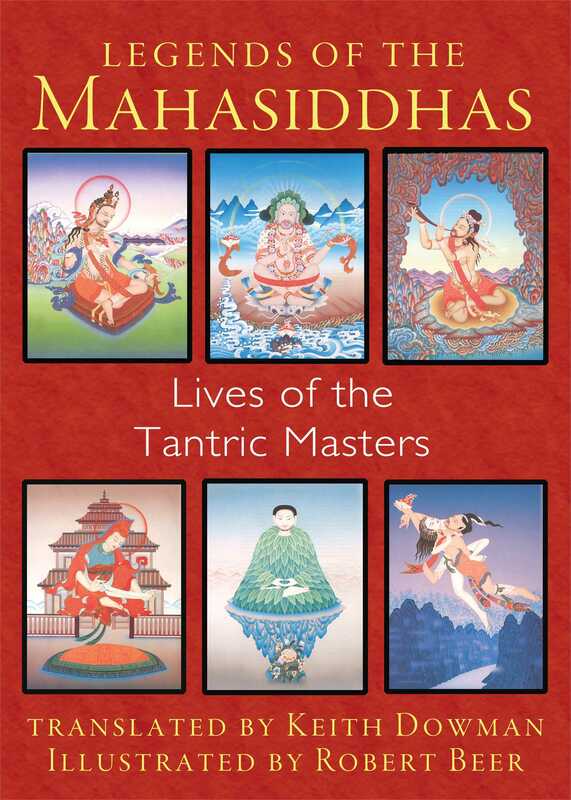 Recounting the magical and “crazy” deeds of the mahasiddhas, such as walking through walls, flying, talking with birds, and turning people to stone, Dowman reveals the human qualities of the tantric masters and the vital elements of the siddhas’ philosophy of nonduality and emptiness. Richly illustrated with paintings of the tantric saints by artist Robert Beer, these stories of the mahasiddhas show us a way through human suffering into a spontaneous and free state of oneness with the divine. Inject water into the ear. Contemplate all phenomena as a lie. Thaganapa was born into a low-caste family in eastern India. Early on, he showed criminal tendencies, and in time his entire life and livelihood came to depend upon exploitation and deception. One day, he was sitting on a log at the edge of a town plotting a beautiful con job, when a wise monk chanced to pass by. “Why are you so deep in thought, my friend?” asked the monk. “It’s a long story, venerable sir,” Thaganapa began. But the monk interrupted. “You’re about to tell me a lie, aren’t you? Haven’t you learned that the more you lie, the more you believe lying is normal, and the more your habit of lying will be strengthened. If you continue on this way, when your karma matures, you will be reborn in hell. Thaganapa turned pale and began to tremble. “Do you think you’re capable of practicing a sadhana?” asked the monk. You say you are a liar. Are lies, then what is truth? Holds falseness to be true. Like the liquid drops on the rim of a water wheel. All sound as inherently deceptive. That even your belief in deception is a lie. For seven years Thaganapa meditated upon all perceptual knowledge as deception. At the conclusion of his sadhana, he gained the understanding that all experience of the phenomenal world is a fiction. Gaining perfect detachment, he came to see all phenomena as dream, hallucination, castles in the air, reflections of the moon in water, images in a mirror. And with his detachment he acquired the qualities of clarity, control, and equanimity. Thinking that he had gained the ultimate goal, he sought out his guru for confirmation. Thaganapa obeyed his guru and returned to his practice. His path was one of resolving paradox, of weaving conflicting thoughts and feelings together into a tapestry of the inherent emptiness of all things. Gaining siddhi, he was known to all as “Master of the Lie,” and he taught those with good karma how to “release water in the ear by means of water.” After many years of selfless service, he was assumed into the Paradise of the Dakinis. Robert Beer studied Tibetan thangka painting in India and Nepal with Khamtrul Rinpoche, the greatest living thangka painter of his time, and with Jampa-la, the state painter of Tibet. He currently lives with his family in Oxford.